One of the fab parties this week at the Tribeca Film Festival was the Tuesday evening bash at BAR 13, hosted by Wallflower Press, the largest publisher of film books and magazines in the United Kingdom. Yoram Allon, Editorial Director and Publisher, was in Gotham with his wife Nicky Allon and editor Ian Haydn Smith as part of the company’s North American launch of the International Film Guide, the authoritative Yearbook of International Cinema, and Film And Festivals Magazine, a quarterly publication covering the world of film festivals. Wallflower Press arranged with the Tribeca Film Festival to distribute close to 1000 copies of the International Film Guide to Festival Industry Delegates as part of their “welcome bags” (which mainly consisted of thin brochures and gimmicky trinkets). Wallflower Press also distributed the April edition of Film And Festivals Magazine, which contains a preview article on the Tribeca Film Festival, as well as wrap and preview coverage of festivals in the first half of 2008 and various feature stories on films, festivals and how-to information for independent filmmakers. The International Film Guide, first published in 1963, is the world’s most authoritative and trusted yearbook of world cinema. 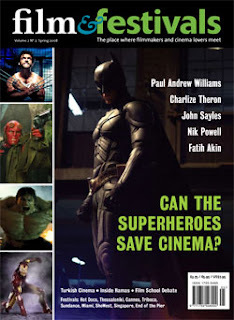 The 2008 edition is a 450-page resource that covers the cinema output of over 100 countries. Special features in this double edition include: coverage of five ‘Directors of the Year’ (Fatih Akin, Suzanne Bier, Guillermo del Toro, Paul Greengrass and Jia Zhangke), a detailed country focus on Germany, industry analysis on documentary and the growth of DVD production and a comprehensive listing and description of all major international and smaller local film festivals from all over the world. This may have been Wallflower Press’ first clinch with the Tribeca Film Festival, but positive buzz surrounding the publications and the fab party makes it pretty certain it is not the last. Stay tuned.